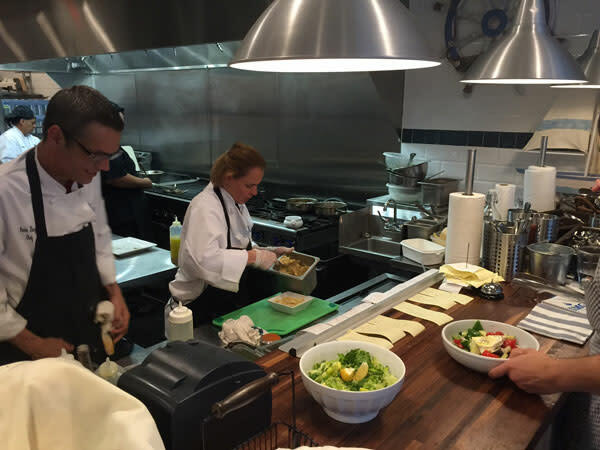 St Armands Circle has found its culinary gem. Based on the restaurant's style and décor alone, I knew the experience was going to be good--but it exceeded my expectations and then some. Open just a month and a half, Blu Kouzina is everything I want in a restaurant. It has an open kitchen; the owners--Chef Effie and Denise Tsakris--are working their places both in the front and back of the house; and ingredients like dried oregano, seafood and wine are shipped from Greece, including the family's own olive oil, which comes from their own trees that are more than 500 years old. It also helps that this restaurant is not the owners' first rodeo. They opened one in Singapore several years ago (heads up: the website reflects that menu and pricing) that continues to be highly rated, and they clearly know what they are doing. 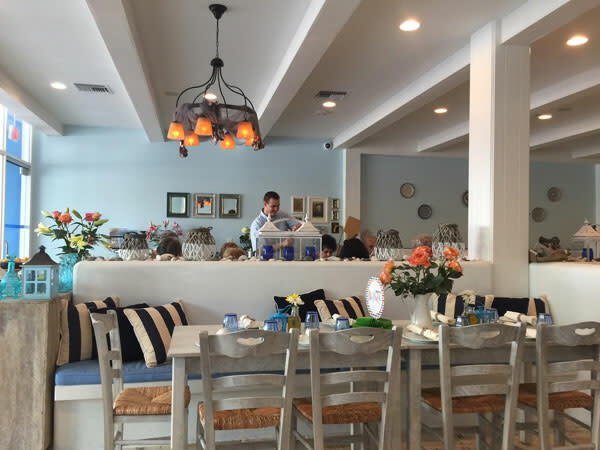 Since my friend, designer Keffie Landcaster, is Greek, has lived in Greece and loves great décor and great food, I decided to have her join me at Blu Kouzina. 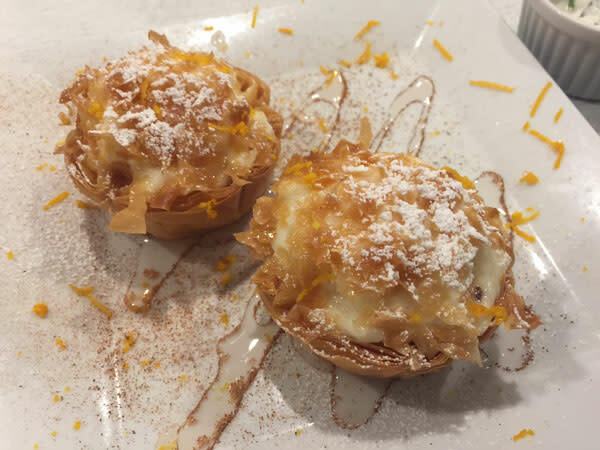 Not only were we--dare I say--blown out of the Mediterranean Sea with the overall deliciousness of the food on our visit, we were already plotting our next visit long before dessert hit the table. First up: appetizers. The bread is homemade and dipping it into sea salt and olive oil is just brilliant. 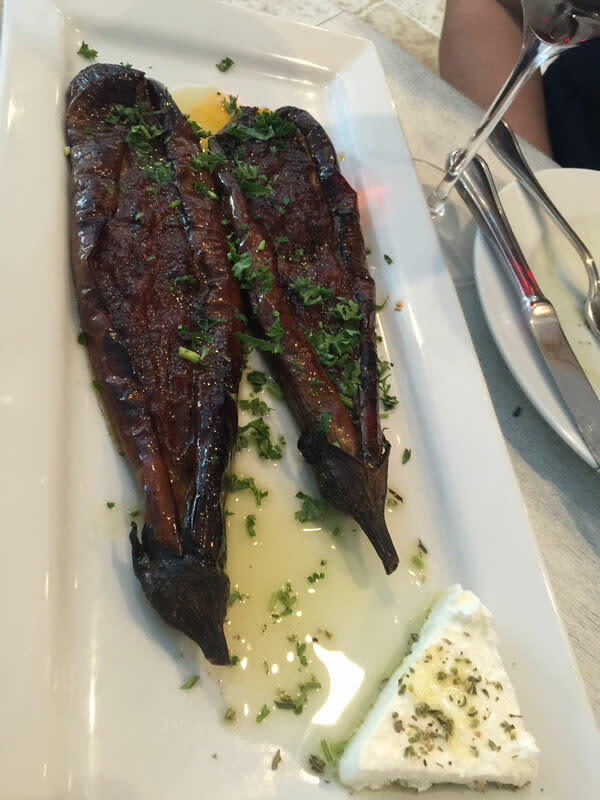 The menu is a lighter, fresher version of the Greek staples, such as grilled eggplant sprinkled with a bit of red wine that's served with a wedge of feta. 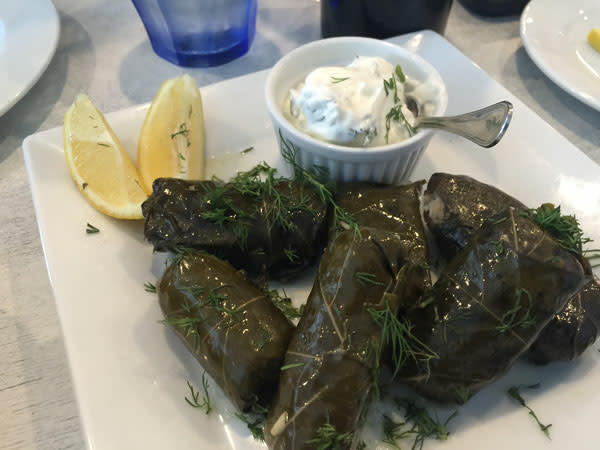 I believe the fresh stuffed grape leaves (dolmades) are the best on the Suncoast; served with a smear of tzatziki, they'll be perfect in the summer heat. Don't miss the warm baked feta cheese with homemade pita, either. In other words, you simply have to go with a large group and try a bunch of items, or return a few days later to try more. 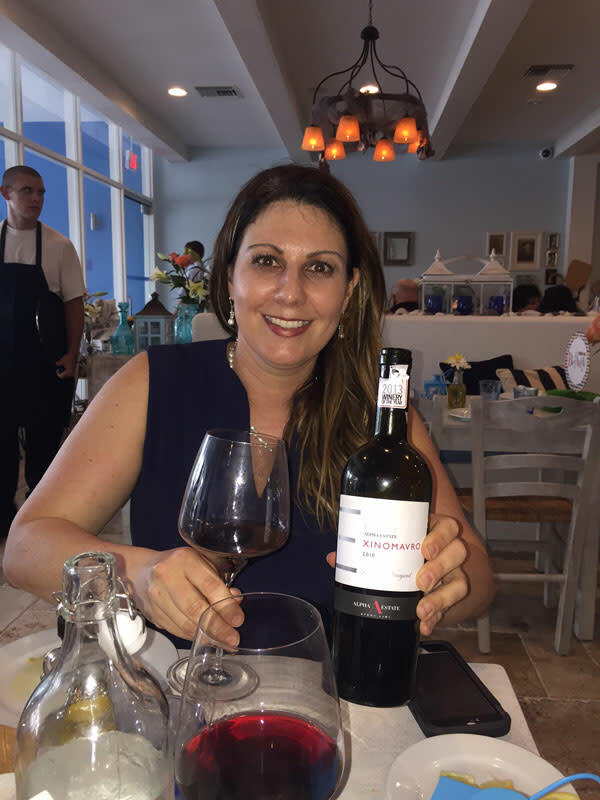 Since I do not know Greek wines, the owner and Keffie selected a medium-priced bottle, similar to a cab blend. It was delightful and full-bodied enough to go with meat, but the tannins didn't overpower our first course. 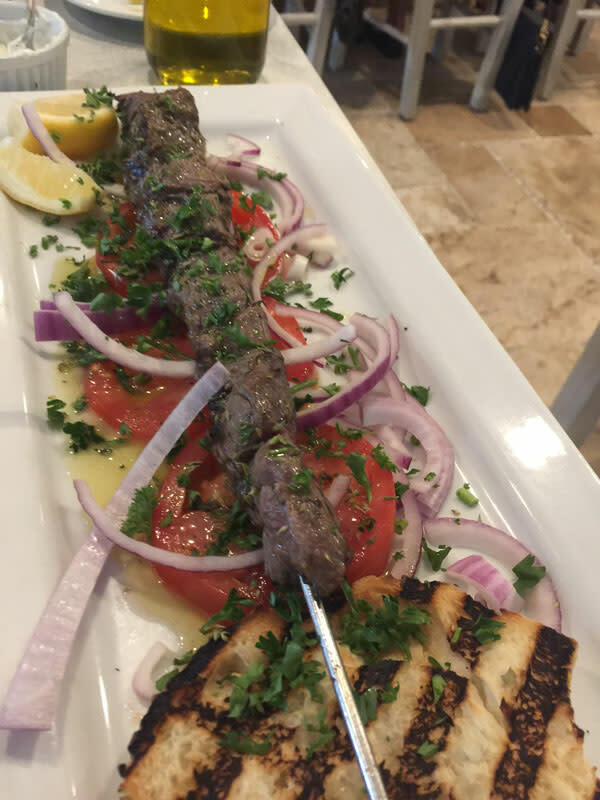 After a light, crispy Greek salad, we ordered a simply grilled beef kalamaki. The beef was tender, with fresh herbs and a hint of lemon. The takeaway: Don’t overdo the ingredients; let them speak for themselves (and here they speak volumes). We also tried the jumbo prawns, which were also simply dressed, sweet and cooked perfectly. Large parties will enjoy what the Greeks know as kreatika anamikta--meat platters with keftedes, kalamaki, bifteki and lamb chops. Just remember to add those grilled prawns! 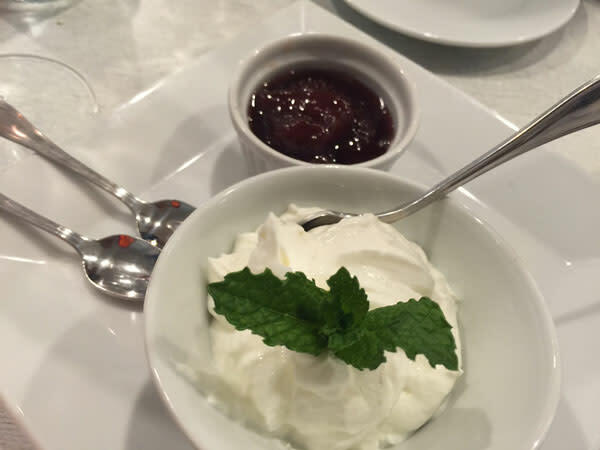 And do not miss the homemade desserts, like fresh yogurt with preserves and thyme honey or galaktobourekos, flaky phyllo filled with pastry cream that will send you over the edge. 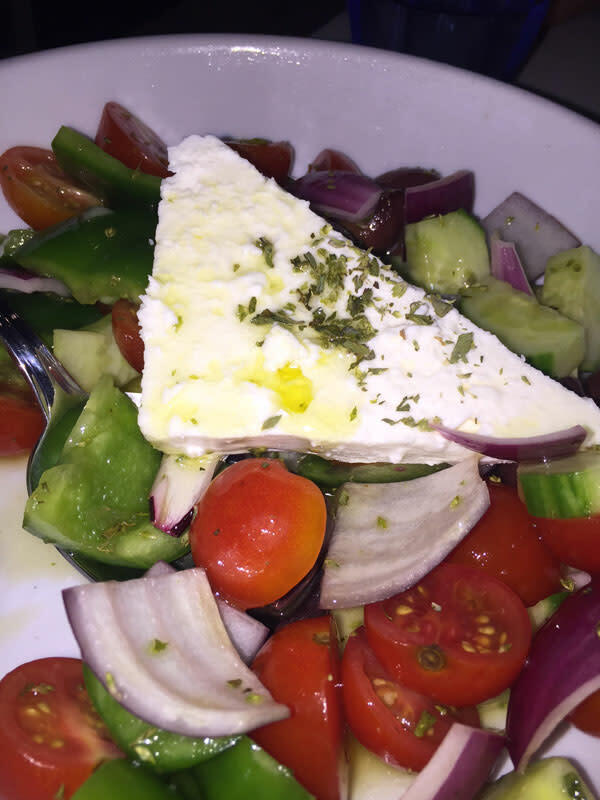 Well done, Blu Kouzina--thank you for bringing the best of Greece to our humble city.